There have been many recent scares involving disease in the agricultural world – from Avian Flu to Plague – which begs the question: what can do you to keep yourself and your farm more protected from the various viruses and bugs out there? The most common contaminator is also the one you least suspect. It touches the largest amount of ground from farm to farm and around town – your feet. Whether you realize it or not, the shoes or boots you wear transmit anything in your farm or any place you visit to the ground. Any measures you take down to the simplest “all employees must wash hands” style precaution shores up your defenses and keeps your livestock, crops, and yourself better protected from dangers too small to see. Sources like the internet keep us more informed and up-to-date on local infection issues, but it’s better to be safe than sorry. What if the disease starts to spread faster, or starts affecting more and more varied targets? Let’s take this idea through the full spectrum of logic, from the common cold to high-risk infections. The amount of protection you can prepare for should already include vaccinations, for both you and your livestock. Once your insides are protected, what keeps random viruses from arriving in the first place? With a little snooping, you’ll find that the most common means of spread (when not airborne) is through the touch of shoes between one farm and another. How often to think about where your shoes have been? Outfitting your building entrances and high traffic areas with disinfecting mats is a great way to ensure that you and your livestock are that much less likely to come into contact with any new sickness. Mats are useful in a variety of ways, mostly due to the fact that the sanitizing liquid that is added can be any style you want, to protect from basic pathogens all of the way up to infectious zombie viruses. The mat’s top side is a fine mesh that covers a foam sponge-like interior; sanitizing liquid is poured into the mat from the top, allowing anyone who steps on it to clean and sanitize the bottoms and a small amount of the sides of their foot ware. The corners are staked through the grommets or eyelets to the keep the mat in the most pertinent areas where the bulk of foot traffic is located. At that point, upkeep is just making sure that the amount of sanitizing liquid is kept so that it covers enough of the shoe, and that it’s replaced whenever the liquid gets too contaminated or old. Clear Sailing from Here On! 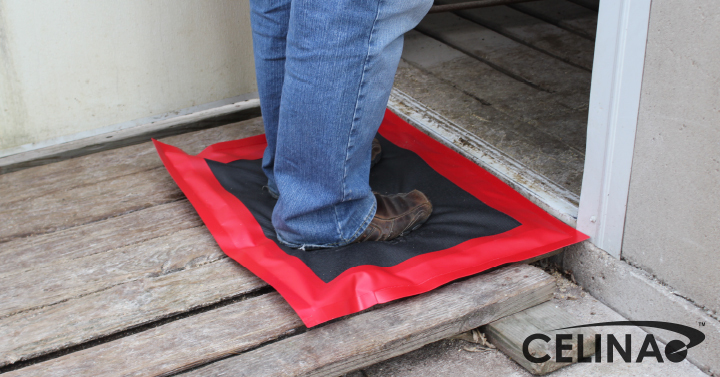 So whether you’re just safeguarding your farm from general infection, or keeping the visitors from bringing unwanted party crashers, a disinfecting mat can give you a base line of protection. They’re easy to install, simple to use, and come in different sizes depending on you need. With disinfecting mats installed, you’ll no longer have to worry about the soles of your shoes. Happy farming! Newer PostChatty Kathys and Stoic Steves – We Deal with ‘Em All!